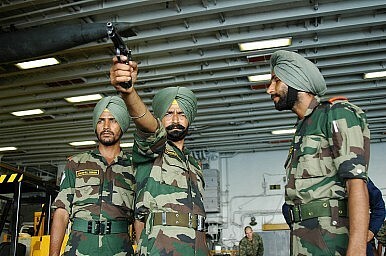 India has just announced the launch of a National Task Force in its latest major reappraisal of its military needs. But will the government follow up? Exactly a decade after India’s first inter-ministerial review of the higher management of its national security took place, New Delhi has once again decided to order a reappraisal of its security architecture. The announcement by the government that it would form a National Task Force to assess the current state of the country’s national security management system is perfectly timed. India’s immediate and extended neighbourhood is in a state of flux—the United States has made public a definite timetable for its drawdown from Afghanistan, while the Arab world, important for India in a number of ways, is in turmoil. All this is happening as New Delhi grapples with an increasingly assertive China. Headed by seasoned bureaucrat-diplomat Naresh Chandra, the Task Force has several former soldiers and statesmen as members. But the team has no easy task ahead of it, and the demands on it are far different from those faced by earlier teams in the six decades since India attained independence from Britain. Specifically, these earlier reviews were based on a reactive posture, born out of specific setbacks and events. The 2001 review, for example, was ordered two years after India was caught unawares by intruding Pakistani forces in the northern state of Jammu and Kashmir in 1999. That localized skirmish had the potential to escalate into a full-fledged war between the two nuclear-armed neighbours. The Kargil face-off prompted the formation of a Group of Ministers, which suggested several new systems and processes to refine India’s national security. While many of those recommendations have been implemented over the past 10 years, some crucial decisions still remain on the back burner. One of these is a key recommendation to appoint a Chief of Defence Staff (CDS) as a single-point military adviser to the government, a suggestion that has remained unimplemented largely because of inter-services differences and reluctance on the part of political parties to take this tough decision. When I spoke with the outgoing chief of the Indian Air Force, Air Chief Marshal PV Naik, recently, he told me that ‘there is no need for a CDS in India for the next five to ten years,’ as it would end up sparking off another round of intense debate in strategic circles. But a more pressing problem for India’s security has been the lack of an effective intelligence coordination group, a problem that has cost India dearly. A body was set up in mid-2001 to coordinate and task intelligence and annual evaluation exercises. However, the group became inactive in less than four years. Sadly, the reality is that the Mumbai terror attacks could perhaps have been avoided had this organisation still been functional. Another reform, aimed at allocating ‘one force to one border,’ is also far from having been completely implemented. The idea had been to give responsibility for each of India’s numerous borders to one dedicated force so as to encourage greater accountability. Accordingly, the federal Border Security Force was supposed to guard India’s borders with Pakistan and Bangladesh, while the 175-year-old Assam Rifles were allocated the difficult India-Burma border to monitor.